2012 Sportkings Premium Back #218 Jackie Stiles in mint condition. 1999 Ultra WNBA #118 Kara Wolters Rookie (Houston Comets) in mint condition. 1999 Ultra WNBA #108 Edna Campbell Rookie (Phoenix Mercury) in mint condition. 1999 Ultra WNBA #101 Dawn Staley Rookie (Charlotte Sting) in mint condition. 1999 Ultra WNBA Gold Medallion #107 Crystal Robinson Rookie (NY Liberty) in mint condition. 1999 Ultra WNBA #1 Sheryl Swoopes (Houston Comets) in mint condition. 1999 Ultra WNBA #82 Cynthia Cooper (Houston Comets) in mint condiiton. 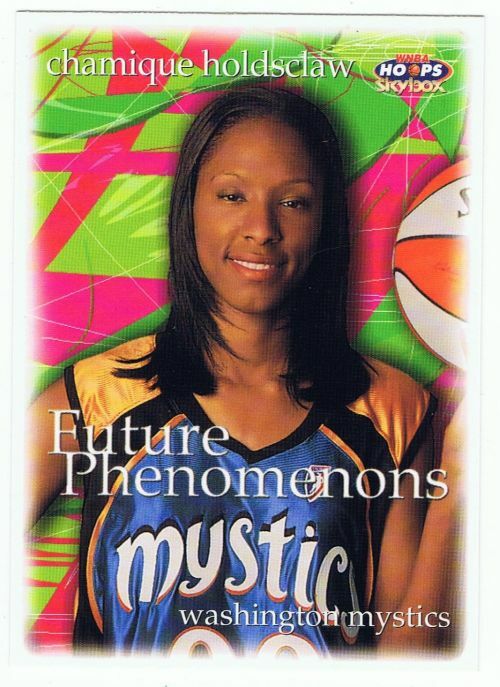 1999 Hoops WNBA #105 Chamique Holdsclaw Rookie (Washington Mystics) in mint condition. 1999 Hoops WNBA #106 Dawn Staley (Charlotte Sting) in mint condition.